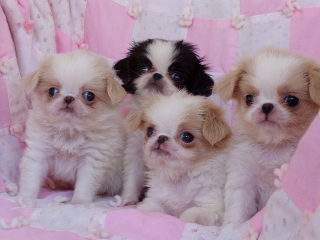 The Japanese Chin is a very ancient breed, dating back to more than a thousand years ago. While its actual origins are shrouded in obscurity, it most likely was introduced to Japan from China and Korea. During the period of Tien Wu Ti and Ch’ih T’ung Ti (A.D. 673-686 & A.D. 690-696) small pet dogs were presented to the Japanese from Korea and China. In the 8th century, a Korean prince brought gifts of Shoku-ken, tiny dogs with snub noses, to the Mikado, Emperor Shomu. During the time of the Manchu rulers, “sleeve dogs” were in vogue and very much in demand. While there were eight different varieties, the differences were mostly in the color and length of coat. It is very likely that the ancestors of the Japanese Chin is one of them, as they were described as being very small, around 4 pounds, and extremely intelligent. These little dogs were treated with much reverence in the Japanese court with whole staffs of servants and the highest honors of the land bestowed upon them. It was rare for the common people to see one and Westerners were rarely gifted with a dog, as the Japanese royal families jealously guarded them and only bred those in their own palace. As a companion dog, the Japanese Chin is known for its intelligence and seemingly uncanny ability to read their owners thoughts and adapt their behavior to suit the owners mood. They are also very loyal and loving. Many feel that there is a resemblance to the cat in their cleaning habits, being known to clean their faces and lick their paws like a cat. They do well in obedience competitions and seem to enjoy learning different tricks to amuse their owners. Chins have also done very well in agility competition. In temperament, he is courageous but even tempered, resilient, happy, amiable and polite. Unique among toy dogs, he is not a yapper. Due to their early heritage of being a “sleeve dog,” Chins are small and squarely built, standing between 8-11 inches at the shoulder, and weighing around 4-7 pounds. The smaller sizes are preferred, but soundness is of the utmost importance. They have a long, flowing coat of white with either black or red markings. The red can range from ruby to mahogany, to orange, lemon and sable. Some may have tan points. A well-defined white muzzle and blaze to the top of the head is common and preferred over a solid colored head. As they are a brachycephalic breed, they have a very short muzzle and large eyes. Ears are drop and well-feathered. The tail is covered in profuse long hair and arches over the back, flowing to either side. 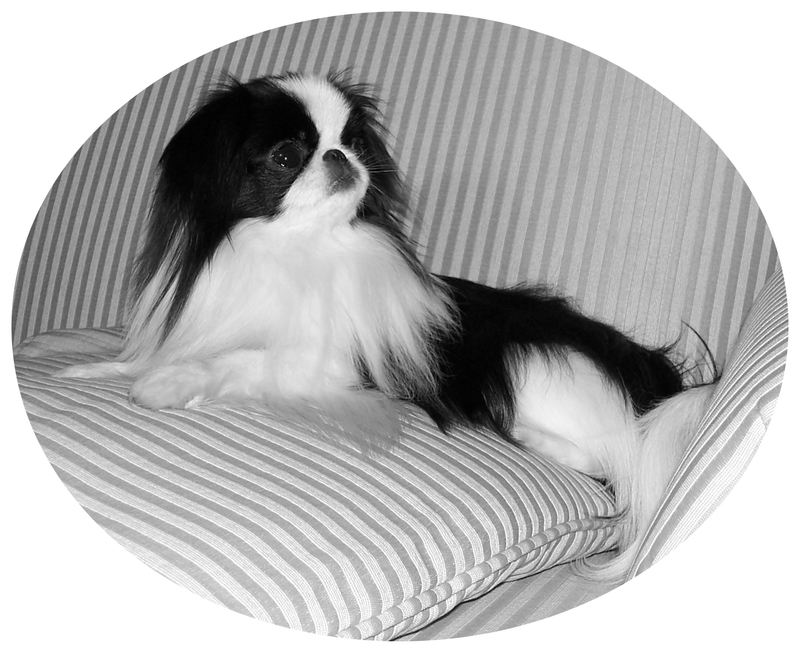 Japanese Chin owners have found that they are a delightful companion dog, being clever, funny and independent. Although uncommon, this breed makes a great pet for those seeking a house dog that enjoys nothing better than a walk around the garden and a lap to sit on. 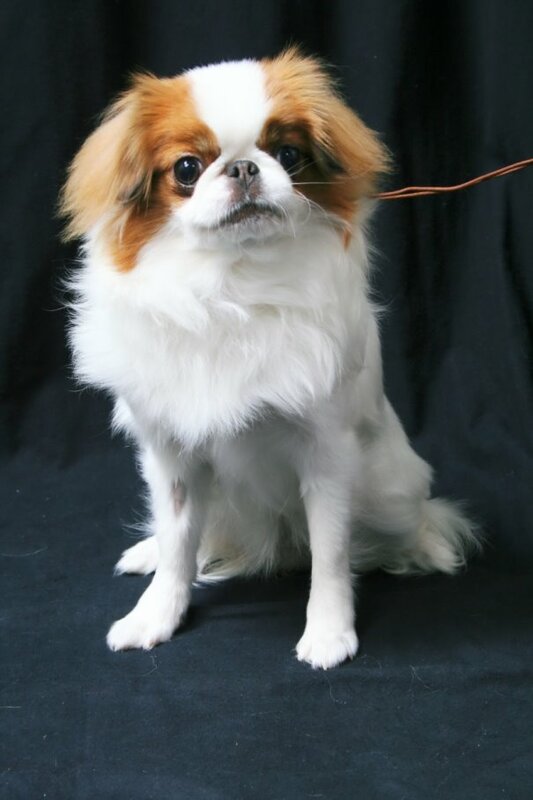 This entry was posted in Breeds of Dogs, Japanese Chin and tagged history of Japanese Chin, Japanese Chin, toy dog breed, toy dogs, uncommon dog breed. Bookmark the permalink.